After hitting a nine-month peak in the previous session, the safe-haven metal slid on Friday following the US jobs data for January with an increase of 304K vs 165K expectations. Gold posted a second straight weekly gain of 1.4% nonetheless. Prices continue to edge down this morning weighed down by a rising US Dollar as traders await comments from a number of Federal Reserve officials this week, which may reinforce expectations for a pause in its rate hike cycle. As expected, Gold prices retreated to the downside after an impressive run to get away from extreme overbought state. 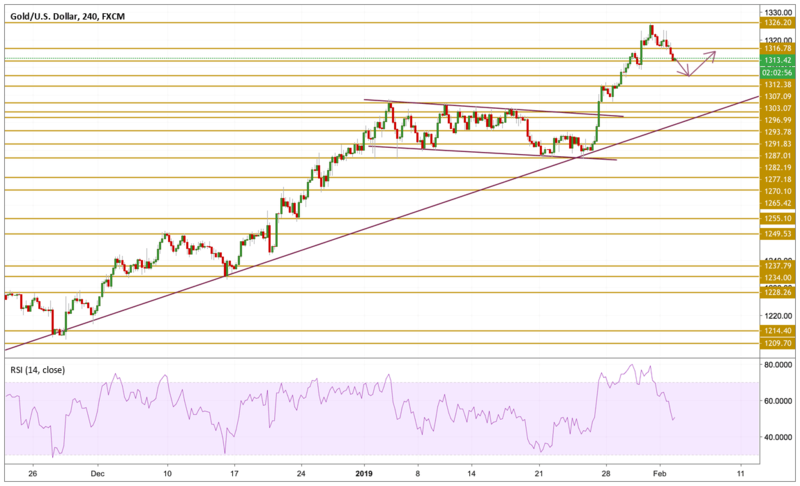 The price is currently hovering just above the $1312.38 support level, however with the ongoing declining momentum, we expect this level to be violated to the downside. We will be focusing on the $1307.09 support level before we turn bullish again on the precious metal.